Question: The robins in my yard have all disappeared. Where did they go? The short answer is that they likely migrated south for the winter. During spring and early summer, robins establish and protect nesting territories, an activity which requires them to be both visible and quite vocal (i.e., singing a lot). Once the robin’s young have fledged and can fly along with the adults, there is no longer any need to defend or even use their territory. So they will disperse, often heading out of a city to spend the rest of the summer in more wild habitats. In the fall, robins start to form large flocks as they prepare to migrate southwards. This is the time when people find their backyard inundated with robins, both adults and the young with their brightly striped breasts. 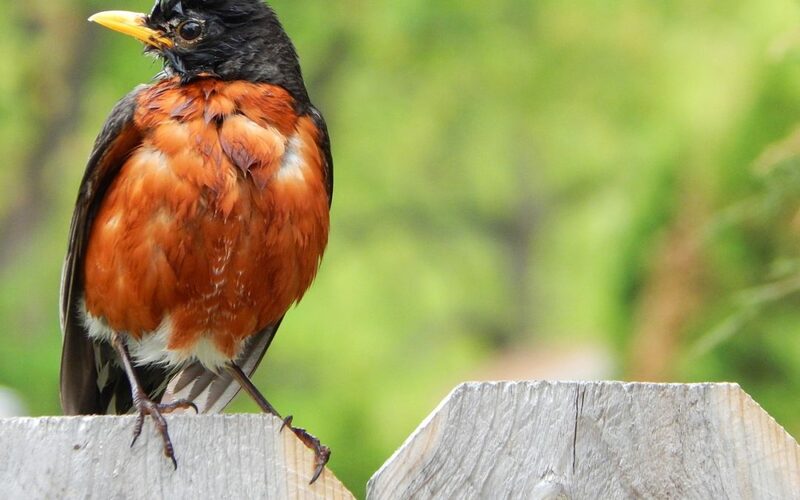 At this time the robins will be looking for both insects and fruit in your yard, so they would be especially happy with backyards that have fruit trees or well developed gardens that promise lots of bugs. Although the robins will be quite happy in your yard for a while, eventually they will decide it’s time to migrate south. Which means that your yard, which had been filled with frenetic activity and lots of color, will suddenly seem very empty. Exactly when they decide to leave and which route they follow southwards is still poorly understood but it is probably influenced by weather and the location of good fruit crops (whether planted or natural) along the way.